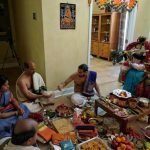 Sri Ramanujamji conducted a Radha Kalayanam to the divine couple, Sri Madhuri Sametha Sri Premika Varadan on Friday, Novemeber 7th 2014, at the residence of Sri Madanagopal and Mrs.Vaijayanthi in Orlando, Florida. 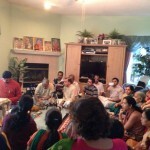 Ashtapatis and kirtans composed by Sri Swamiji were rendered during the event. 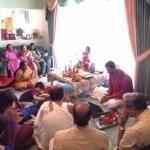 About 50 people attended the event and enthusiastically participated in the divine wedding celebrations. 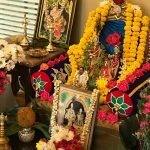 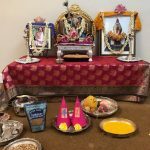 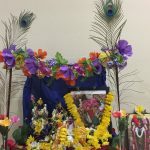 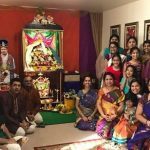 One Response to "Radha Kalyanam in Orlando, FL"
Namaskaram. 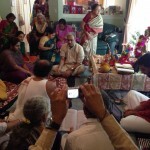 I am residing in Coimbatore India.My son is doing 12th. 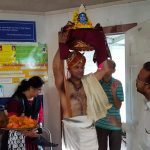 I just came to know about your speech and prayers .I kindly request you to do special prayer for my son and to my family.